THIS RESIDENCE at Pretoria is situated in Brooklyn. 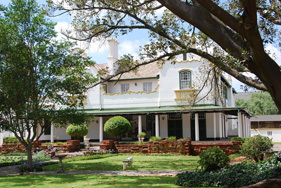 Originally it was a single storey built and owned by Rupert Marais, Esq. On changing ownership, the second storey was added together with many additions to the garden lay-out. The charm of this house has been greatly enhanced by the placing of the trees in the garden scheme. The trees form a suitable setting for the white walls of the house and show a happy blending of nature with the "Cape Dutch" architectural treatment of the gables and, parapets, large windows and wide stoep. The rooms are large and include a special living-bedroom containing a cabinet for the treatment of asthma. The dining room occupies practically the whole ground floor wing of one side and is treated with the traditional type of " Dutch " panelling, two fireplaces, built-in cabinet fittings, and heavily beamed ceiling.